The earliest card for Erickson is from this year 1990. It's one of only 5 types of minor league cards produced with Erickson. 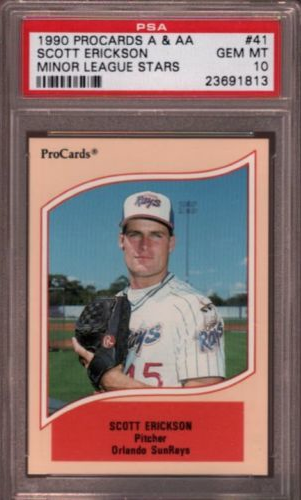 The only other team he played for prior to Orlando was Visalia, making his MLB debut with the Twins on June 25, 1990. His official rookie card is the 1990 Topps Traded #29T. That is readily available. The card pictured above, in it's PSA 10 Gem Mint condition is rather rare. Here's the current PSA population report as of today. This card is has a population of 1. Yep, the only Gem Mint 10 out there. And it's available as of right now. Want to grab this card while it is still available? Click on this link to get it. It's a buy it now so you can pick it up without delay. Make sure you check back for our next Gem Mint Monday.